Monday, August 25, 1980—finished getting ready for the hunting trip. Mike and I left at 3 p.m. We got to Crooked Creek and the Little Nelchina confluence at 8 p.m. and camped for the night. I got stuck and had to winch out once. We saw a caribou, but it was so early in the hunt, we didn’t want to shoot it. We expect to be out here hunting for about three weeks. Tuesday, August 26, 1980—up at 6 a.m., broke camp at 9:00, reached Flat Creek at 11:00 and went on to McDougal creek. Went up McDougal 3.5 miles, prospecting on the way and glassed for sheep and camped. Saw one caribou. Wednesday, August 27, 1980—went up a mountain of rotten rock, held together with very little moss. We got up on the shoulder of that mountain and sat down to rest for a while. We were looking the country over and we saw a wolf—this wolf had a white tail tip, much like that of a red fox. We watched this wolf and he seems to be going somewhere, but he’s hunting as he goes along. Pretty soon we see him get very cautious and he circles around, finally he goes in to feed on a caribou that a bear has killed—but he’s always looking around in fear that the bear will come along, but it doesn’t show up. 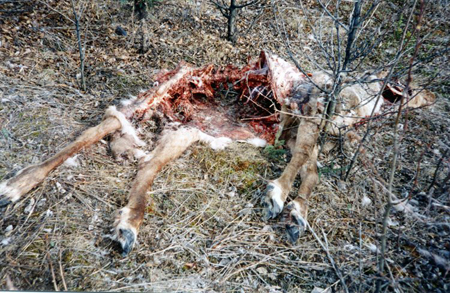 He fed for a while until he took the antlers in his teeth and dragged them off for a ways and kind of worked at that. The last we saw of him that day he was going off to the north. Then we went on up the mountain. We had to cross—I guess you’d call it a slice or crack in the mountain. The rocks are rotten here. This kind of rock, when exposed to oxygen, gets rotten, and it’s so steep there, it rolled down this chute. We crossed on the upper end of it on snow and we get over to the other side and crawl up there. We can see a lot of country out there. All we saw was ewes and lambs, no rams. We decided there was no sheep to hunt here, so we back off and get back to this chute and we want to cross it but the snow is no longer frozen and it’s soft from the heat of the day. We had a little trouble getting around it and we got across it to the other side and we climb out and we go over to the shoulder of this mountain and we start to go down that shoulder and it does not feel good to us. The rocks are rotten. Didn’t give us any trouble climbing up but, going down—and it’s so far down that if one of us slipped and fell, we’d roll for a long ways. So we went back up on top of the shoulder to decide what to do. We went back over to this chute and I tested the rocks along the side we were on. I could pull them loose and drop them and they’d roll down this chute. But out in the middle of this chute there was solid rock. I told Mike, “I’m going out on that and see what it looks like from out there.” I went out on that and it was solid and after a few minutes of mulling this dilemma over, I told Mike I thought we could go down this chute (the loose rock was something like a couple feet deep or so) and I thought I could walk down it, sliding all the time, of course, and the rock’s going to be moving and we’d have to keep our feet moving and not fall. It took Mike some time to decide he wanted to do that and we decided to go. I started down in the center of this. I would pull my foot up and take a great big long step and then the next foot and all the time sliding, a pack on my back and a rifle. It went really well and I could see down there that there was a bulge out from the mountain and this chute makes a slight turn there and I aimed my downward movement to come to that bulge so I could stop there and look things over. Mike, he’s coming down and when I got to that bulge, why it looked good from there on down so I continued on down. Then Mike came down. It turned out fine. Thursday, August 28, 1980—this day we decided to go through the pass to the west and, by gosh we saw this gray wolf with the white tipped tail again. He was hunting on a mountain over in that area. We got out to the end of the pass and it’s a vertical drop to the little creek on that side. We didn’t go down—no way for a man to get down there. We glassed for game for a while and watched the country, really nice there, but we didn’t see any game—no sheep. Friday, August 29, 1980—we got the dredge off the top of the swamp buggy and put it to work in two places on McDougall Creek. We got some gold, but it’s fastened to a darker material–tried a magnet on it and decided it was mixed with iron and could be magnetized. We did catch one grayling. Saturday, August 30, 1980—Mike and I dredged again in McDougall Creek and today again, we had poor luck finding any gold. The gray wolf fed on the bear kill again. Charlie had a pilot fly him over us. They landed down at the confluence with the Little Nelchina where the pilot let Charlie off. Mike and I went to meet him. I broke a wheel on the swamp buggy at Flat Creek. It was pretty dark by the time we got Charlie to our camp—good to see him. Sunday, August 31, 1980—Mike left for Gunsight Mountain to get my welder so we could fix the wheel on the swamp buggy. Meantime, Charlie and I hunted caribou. Saw three and didn’t shoot. This entry was posted in Journal Entry and tagged caribou, Crooked Creek, Flat Creek, grayling, McDougal Creek, mountain chute, rocky slide, sheep, wolf. Bookmark the permalink.